It’s one thing to attend a conference; it’s quite another when you host one as we have done for the past two years. It’s a significant undertaking and requires a lot of planning. But the key to success boils down to the relevancy of the topics and thought leadership of the speakers — do I believe the topics and speakers are worth carving out 1½ days to hear? As we know from the past two years, the answer is a resounding “yes” if you have the right mix! We’re excited to announce the 2014 Customer Engagement Marketing Summit to be held September 17 & 18 at the JW Marriott Buckhead in Atlanta. First task at hand — a call for speakers and sponsors. 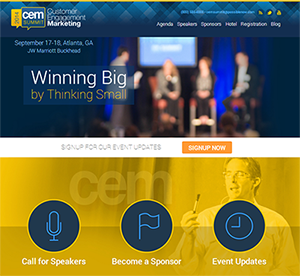 The theme of this year’s CEM Summit is “Winning Big by Thinking Small.” The small refers to the idea that small data is a powerful way to unlock and understand how to engage your customers more effectively. We’re looking for the same type of global brands and industry experts who can energize and engage the attendees at our 2014 CEM Summit. We expect this year’s event to attract marketing and customer experience professionals and executives who are involved in customer engagement, mobile marketing, social media marketing, customer loyalty and retention, and other facets of direct marketing. If you are a dynamic speaker who can provide actionable advice to marketing and customer engagement professionals, please complete the Speaker Application at www.cemsummit2014.com. The deadline to submit speaking proposals is April 30. PossibleNOW will announce the speaker lineup in mid-May. We hope to talk to you soon about speaking or sponsorships — and better yet, we hope to see you at the CEM Summit in September!